My first encounter with the name Anthony Ryan happened a few years ago when I was scanning for books from A to Z and surfing on the website of one of my favorite bookstores. I was looking for new authors that would interest me and lo I found Blood Song, which is the first book of the said author. The novel was an instant favorite of mine and so same is true with the author. Some months after, the same author published Tower Lord, but still I haven't had a chance to get a copy yet. I browsed for some review and it was quite troubling because many find it not at par with its predecessor... So came the doubt if I should continue with the series... and then I decided I would. Now the third book in this planned trilogy has been revealed as well and it is called Queen of Fire. Herein you can see the official cover and synopsis of Queen of Fire by Anthony Ryan. Upon seeing these updates my enthusiasm has returned. So I decided that I will buy both the second and this final book together come July next year. After fighting back from the brink of death, Queen Lyrna is determined to repel the invading Volarian army and regain the independence of the Unified Realm. Except, to accomplish her goals, she must do more than rally her loyal supporters. She must align herself with forces she once found repugnant — those who possess the strange and varied gifts of the Dark — and take the war to her enemy’s doorstep. 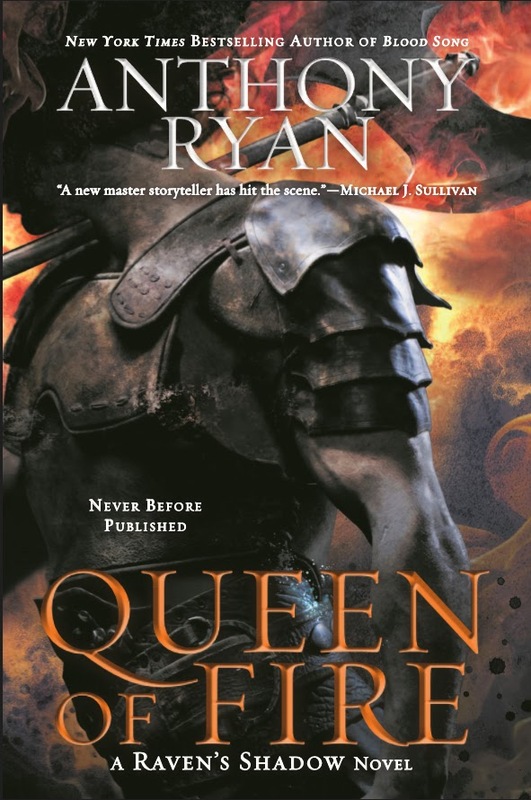 Queen of Fire by Anthony Ryan will hit bookstores on July 7, 2015.